Tracing the movements of the Sephardic Jews to the Balkans - following their expulsion from Spain during the Inquisition - Schwartz draws on place names, historical chronicles, epitaphs, folk ballads, banned books, and the media. He explores the travails, and remarkable cultural achievements of these communities who, hundreds of years after the trauma of forced exile, were almost entirely destroyed in the Holocaust. 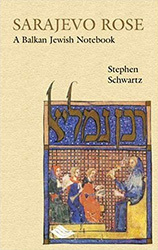 Schwartz explores the richness of the literature, poetry, mythology, and craftsmanship, as well as the intermingling of Orthodox, Jewish, Catholic, and Muslim communities in the Balkans - from Sabbatai Zvi, who declared himself the Messiah in the 17th century, and who reputedly chose conversion to Islam; the evolution of the Jewish mercantile industry; to the 'Renaissance Jewish Traveller' Abraham Kohen Herrera, a convert under duress during the Inquisition who later discovered his Jewish heritage through mysticism, and who may have been the model for Shylock in Shakespeare's Merchant of Venice. This is not only an historical analysis, but also a personal journey. The author's poignant descriptions of attempted pilgrimages to Jewish cemeteries and synagogues throughout the Balkans are testament to his yearning for historical pride and proof of existence.